This power steering side cover is used to enclose a power steering assembly in an automotive application. The part was formed from a D65-45-12 ductile iron, and required to be machined to tolerances of ±0.00035". 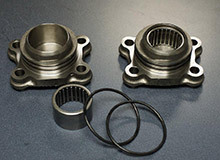 The machining process required CNC milling and turning, which included drilling, boring, grooving, and threading. Our facility is equipped with advanced CNC machining centers with capabilities such as robotic loading and unloading, inverted vertical lathes with live tooling and much more. 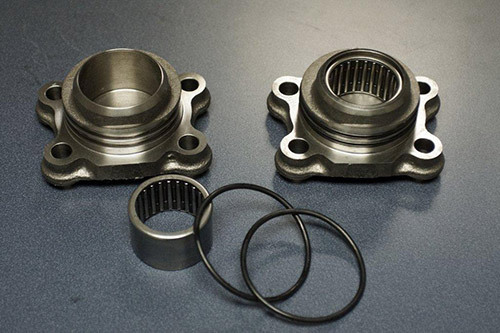 After machining, the covers are assembled with the installation of bearings, then roll formed to secure the bearings, and o-rings are installed and then on to final inspection. All parts where subject to comprehensive quality measures such as dimensional verification utilizing bore gages, vision system inspection, functional gage checks, and outside diameter checking with machine compensation. We currently manufacture 240,000 of these parts per year for this customer in Lafayette, Indiana. For more information on this precision CNC machined product, see the table below or contact us directly. Overall Part Dimensions Length: 5"